4.5 ft. Right Drain Walk-In Whirlpool and Air Bath Tub in White Walk-ins provide a safe and independent bathing experience. Using the latest in tub crafting techniques and industrial grade materials, walk-in tubs offer an impressive line to meet your specific needs. With ADA compliant designs and features, walk-in tubs offer the satisfaction and peace of mind needed to truly enjoy a luxurious soak or a vibrant, soothing experience. 4.5 ft. 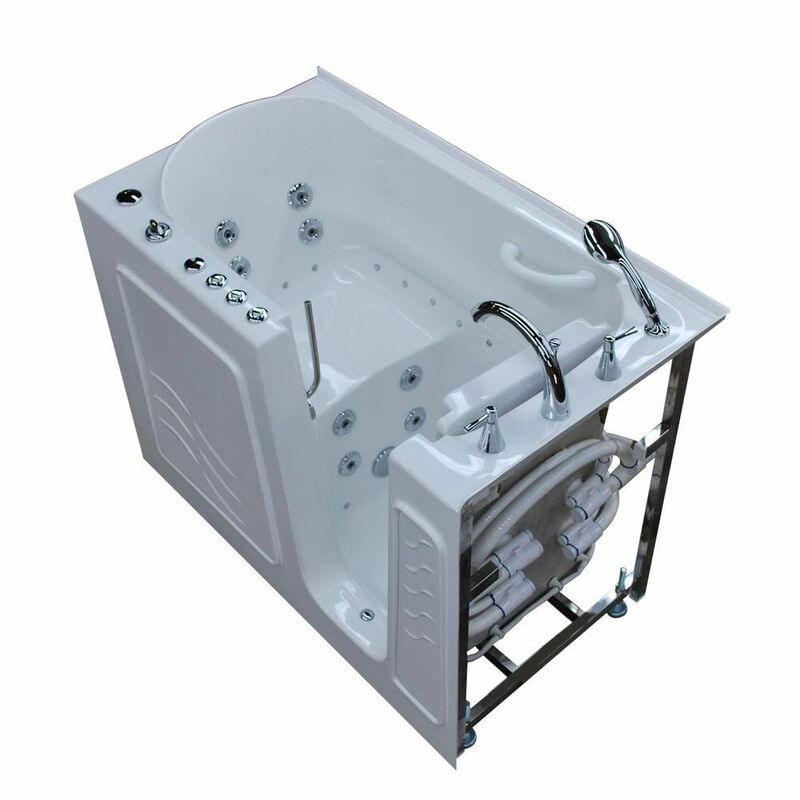 Right Drain Walk-In Whirlpool and Air Bath Tub in White is rated 3.8 out of 5 by 10. Rated 2 out of 5 by Willie from I am not satisfied with the walk-in tub. The... I am not satisfied with the walk-in tub. The tub drains continually. It is a slow drain, but it does drain and cannot be stopped. The pump for the water jets is weak. It pumps the water through the outlets, but it needs to be stronger, it needs a stronger pump. I need a strong pump to provide some relief for my back pain. Rated 1 out of 5 by Vaunasha from Tubs were too short for our units.... Tubs were too short for our units. Rated 5 out of 5 by kat from Looks great - doing bathroom renovations so not installed yet. Great shipping and good notifica... Looks great - doing bathroom renovations so not installed yet. Great shipping and good notification of delivery. Rated 4 out of 5 by HomeDepotCustomer from We have not installed the tub yet and it will... We have not installed the tub yet and it will not be completed until March or latter. Rated 3 out of 5 by HappygalinCO from This tub will only work for you if you're 5'2"" or shorter and 150 lbs or less. I'm only 5'5"" and ... This tub will only work for you if you're 5'2" or shorter and 150 lbs or less. I'm only 5'5" and I'm too tall for this tub to work effectively. When I sit on the seat the water is only up to my waist line, and if I slide down to my neck it's very uncomfortable and my knees hit the other end of the tub. The width of the tub is quite narrow when you're in it. I've figured out that I can turn around and kneel on the floor and face the seat as in prayer position and then I'm up to my neck in water and it's quite wonderful. It takes a long time for the tub to fill, probably 10-15 minutes. I wash my hair while it's filling. It does drain quickly, 1-2 minutes. We installed a towel warmer right next to the tub so I can wrap a hot towel around myself while it's draining. The jets are somewhat powerful but they aren't strong enough to really work on my back pains. We had to pay a lot of money to get a plumber and electrician to hook this tub up. The plumber took about 6 hours total to get everything up to local building code standards and pass inspection, and good plumbers don't come cheap! The lighting is nice, I didn't think it would do anything for me but it does add a nice touch when you're soaking with arthritic pain all over. I wish though that you could set the light on one preferred color rather than the cycling through colors being constant. We have a 50 gallon water heater and I pretty much drain it filling this tub, so no one in the house can take a shower for at least an hour after I'm done. If you're taller than 5'2", you'd be better off finding a long, deep jetted bathtub that has a walk-in door or an outdoor hot tub. I wish they made these tubs wider and longer. A bit of a disappointment, but given how much money we spent getting it installed, I'm figuring out how to make it work for me.